It was my happiest birthday ever,this year since I got 5 birthday party in total! 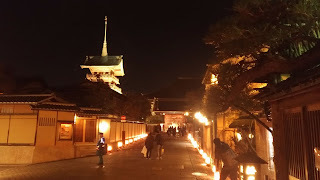 3 of them were actually at Osaka and Kyoto Hana hostel. 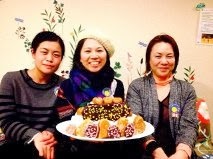 We had a new year party at the begging of 2014 at Osaka Hana hostel and I and Karie(from J-Hoppers Kyoto) got a lovely birthday cake as surprise! Chocolate sponge and sweet whip cream with our name which made by cookies on it. And then another 2 at Kyoto Hana hostel on my birthday. I was working on the day but I fond the light at the reception was suddenly off. 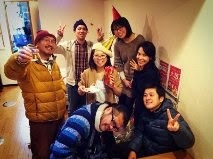 Wakana who is my coworker came from back yard with a birthday cake and my coworkers were there as well. My big boss came with a champagne for me and we made a toast. I actually could not drink it at the time since I was on my work unfortunately but I had it after work on the day with Shiori who is our night duty staff. 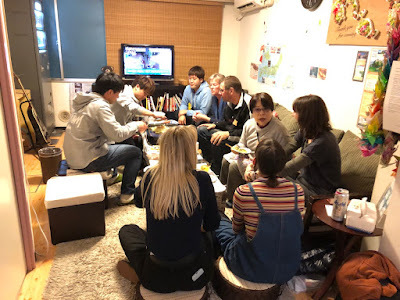 Also I had another one at Kyoto Hana hostel again since we had a birthday party for staffs who were born in January at the end of the month. I and other 2 staffs got big fancy cake with our face. 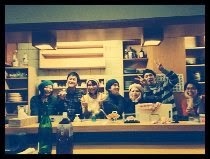 Then I actually got 2 more birthday party with my friends this year( 艸｀*)!! What a happy begging of 2014. Thank you very much for all who cerebrated my birthday.